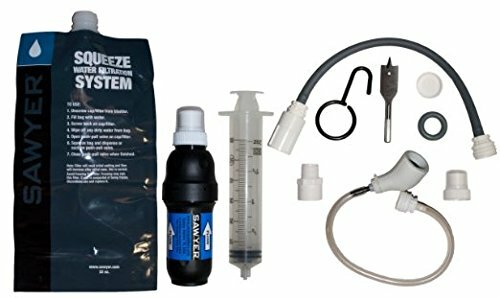 Many new preppers forget that they may not always have instant access to basic survival items that they stock either at home or in their vehicle. When you are at work, school, ect. and an emergency happens, what if you cannot get to your vehicle for your BOB or to get home? Earthquakes and tornados can easily destroy you vehicle after you have taken shelter. So the idea of Every Day carry is just that. There are an unlimited number of products and possibilities that you can employ to satisfy your individual situation and tastes. The items shown are simply representative of the types of items you should consider always having on you. 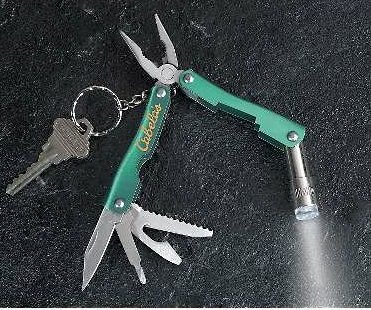 Of course you will adapt your EDC to your lifestyle. White collar, blue collar or no collar, there are certain general areas you want to cover with your everyday cary items. This Gerber Obsidian is not only an excellent pocket knife, but has a can opener, two screwdriverheads and a small file as well. 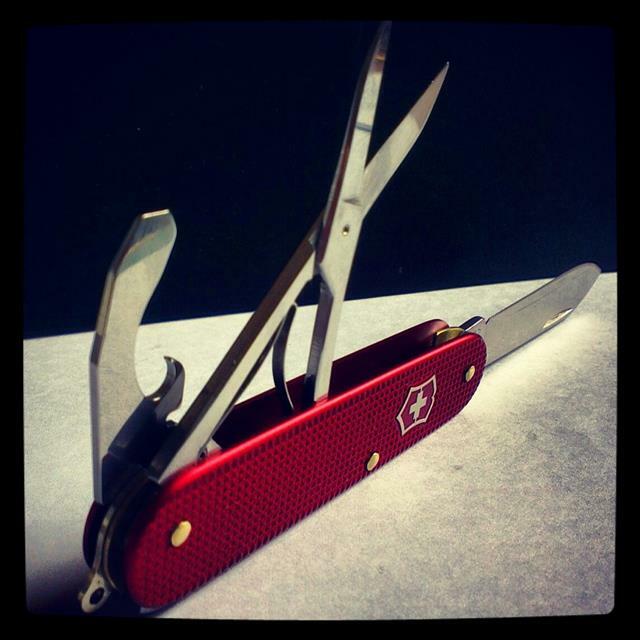 A Swiss Army knife is also great. Make sure you know your local laws on carrying knives. 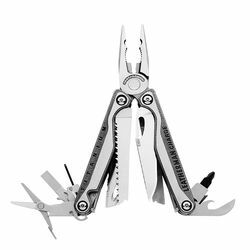 This can be a full sized multi tool such as this Leatherman Charge on the left. Always have some sort of small light with you. 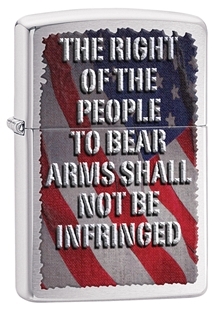 It could be a mini-Mag light or a small one attached to your key chain. 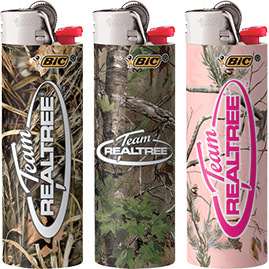 Even if you don’t smoke having a cigarette lighter can be very useful. 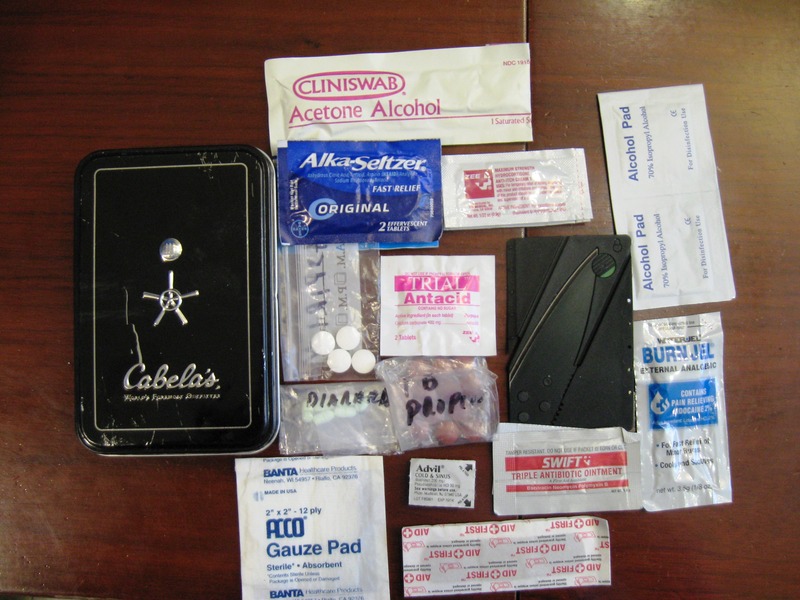 You can make a small but efficient minimal first aid kit that will fit in an Altoids can. I made mine using a Cabellas gift card can. Having a charged cell phone in an emergency can be a life saver. You can dial 911 if injured. You can be found if lost by your signal. Many smart phones have GPS in them. These are truly modern miracles. The problem with them is twofold. First you have to be in range of a cell tower that works. Second, you have to have a charged battery. The items listed here are easy to carry and have daily as well as emergency uses. You can cut wood or rope. You can make light repairs. Open cans and bottles. See in the dark. Tie things up and tie things down. Start a fire for warmth or signaling and manage minor injuries. You can call for help. And these items are always with you. Now let’s talk about personal defense in regards to every day carry. I made this a separate issue due to a number of factors. If you live in Arizona where the law allows concealed carry of a firearm without a permit, you have a lot of options. If you live in New York City you don’t. A lot of places are somewhere in between. Many people choose not to carry a lethal weapon even if they are allowed. 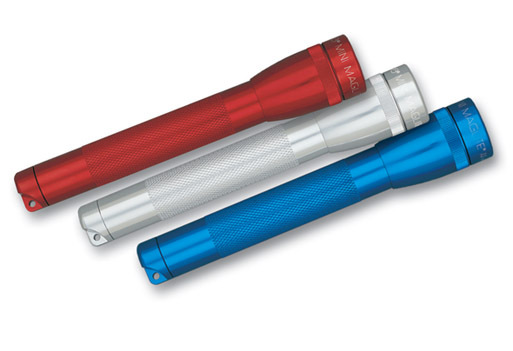 There are a number of non-lethal options available, primarily various versions of pepper spray. Remember that the whole idea of EDC is to keep you going until you can get to your main gear, whether it is your Get Home or Bug Out Bag in the vehicle, or your supplies at home. Having a way to defend yourself from predators either two or four legged kind is essential. Consider your situation and options carefully. If you choose to carry a firearm, know your local laws and get professional training from a qualified firearms instructor. Now we are ready to begin understanding some basic Prepper concepts leading to building a bug out bag. I suggest having a whistle as well. 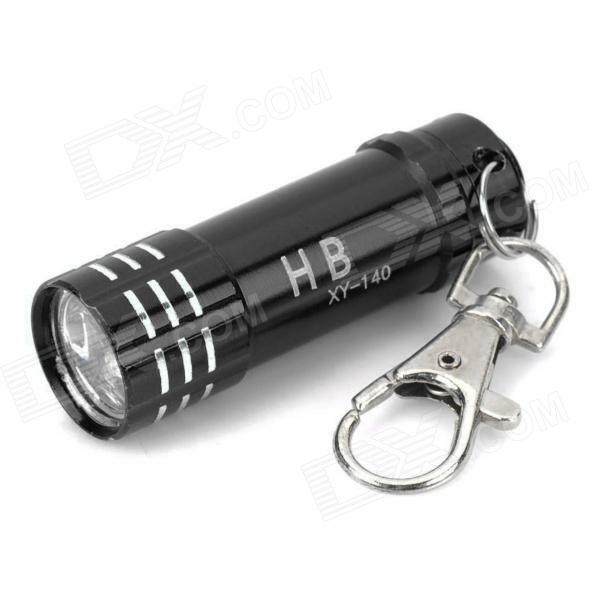 Small, light, cheap and so much more effective than yelling. It may even discourage someone who is thinking about doing you harm. A large bandana has many uses as well without adding much bulk or cost. Personally, I’d also have a length of paracord (10 – 20′) as well, possibly woven into an easily unraveled bracelet. Other considerations: Fresnel lens or other magnifier for small print/fire starting, Small toothbrush and floss (Flosscard is an interesting option). If you have contacts, a contact case, and if possible, a pair of glasses. I learned this the hard way after an unexpected trip to the emergency room. I was able to take out my contacts, because I did have the case, but could not read the additional medical forms the next morning. Of course, if you have any medication which would be a problem to skip a few doses, carrying some would be wise, along with anything (practical to carry) you might need to deal with a condition you are susceptible too. A pair of earplugs might come in handy, as well as a few feet of duct tape wrapped around something you normally carry, and a basic sewing kit. Check our Scottevest for a line of clothing with lots of pockets to aid you in EDC. All excellent suggestions. To me, the fun of putting an EDC kit together is tailoring it to the current situation. As I am a legal resident of Germany and live there part of the year, I have a EDC that conforms to both climate and legalities. Much different than the one I carry here in Arizona. KISS i.e. keep it stupidly simple. Stick defense is what it is called in the UK where OAP’s and knackered sods like me use it. Singlestick (to give it the martial art it’s correct title) is a formidable art and it takes a lot of training to do well. IMHO that’s NOT what is needed. A simple easily taught series of counters and strikes suitable for a range of ages and physical abilities. Living in a country where even thinking harsh words is likely to get you in trouble, The walking stick (if there is a genuine reason for carrying one) is my UK weapon of choice. Germany is the same way. I am a legal permanent resident there, but when I am there, my bullet launchers have to stay in the States.. Like you though, they do allow air rifles and my brother in law and I go to the local little indoor range and practice. The mandatory beer afterwards too! You can shoot in Germany and I have both target and game. OK I had to pass their idiotic exams in German but did it (on the second attempt as the official couldn’t understand by broad Dorset accented German). As for the beer, lovely. True. And when I settle there I will join a club and get certified. They have really tighten the laws in the last few years. Knee jerk reaction to their active shooter incidents.I will certainly not be allowed to take my AKs! (Although the Russian mafia in Berlin has no problem acquiring them). Took the immigration test in German. No problem,but I’m obviously “Amerikanner” to everyone I speak to. “Speak softly, and carry a big stick” is missing from the non lethal arms list..
A hugely under appreciated weapon is a humble walking stick. With the correct training it allows you one important edge in a situation, the ability to keep people AWAY from you. Once they have breached your personal space it then becomes a weapon. Again, with training it’s as effective as a knife, and silent. The walking stick is an excellent point! Besides being an effective defensive weapon in trained hands, it makes walking long distances with a rucksack much easier. In the UK you have a long history with the staff, something we don’t have here in the States unless you are a practicing martial artist. I intend to address both martial arts trainining and fitness for preppers in future articles.